Recent reports have suggested that aspirin effect might be influenced by bodyweight, with decreased efficacy in heavier individuals. We investigated the influence of bodyweight on aspirin pharmacodynamics in two independent datasets of patients taking non-enteric coated aspirin 100 mg QD for coronary artery disease (CAD). In the first dataset, 368 patients had their platelet aggregation assessed using VerifyNow Aspirin and measured in Aspirin Reaction Units (ARU). 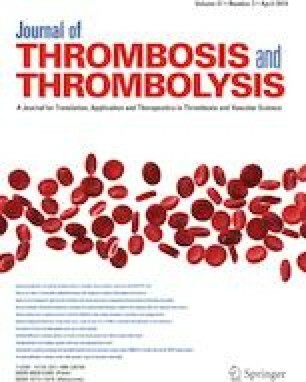 In the second dataset, 70 patients had serum thromboxane B2 (TXB2) dosage assessed by an ELISA assay and measured in pg/mL. Platelet aggregation was independently associated with bodyweight, with 8.41 (95% CI 1.86–14.97; adjusted p-value = 0.012) increase in ARU for every 10 kg. Furthermore, the rate of non-response to aspirin (defined as ARU ≥ 550) was significantly associated with increased bodyweight (adjusted p-value = 0.007), with OR = 1.23 (95% CI 1.06–1.42) for every 10 kg. Similar results were found considering body mass index (in kg/m2), with 15.5 (95% CI 5.0 to 25.9; adjusted p-value = 0.004) increase in ARU for every 10 kg and non-response OR = 1.43 (95% CI 1.13 to 1.81, adjusted p-value = 0.003) for every 5 kg/m2. Moreover, serum TXB2 was higher in patients weighting more than 70 kg (222.6 ± 62.9 versus 194.9 ± 61.9 pg/mL; adjusted p-value = 0.018). In two different datasets of patients with CAD on non-enteric coated aspirin 100 mg QD, increased bodyweight was independently associated with impaired response to aspirin. The online version of this article ( https://doi.org/10.1007/s11239-019-01830-z) contains supplementary material, which is available to authorized users. RHMF contributed to study design, data collection, statistical analysis, data interpretation, and drafting of the manuscript, RPG contributed to data interpretation and critical review of the manuscript, TFD contributed to data collection, data interpretation, and critical review of the manuscript, FBB contributed to data collection, data interpretation, and critical review of the manuscript, CJDGB contributed to data collection, data interpretation, and critical review of the manuscript, PRRG contributed to data interpretation and critical review of the manuscript, AF contributed to data collection, data interpretation, and critical review of the manuscript, FRM contributed to data collection, data interpretation, and critical review of the manuscript, CAKN contributed to data collection, data interpretation, and critical review of the manuscript, MASF contributed to data collection, data interpretation, and critical review of the manuscript, AGF contributed to data collection, data interpretation, and critical review of the manuscript, RS contributed to data collection, statistical analysis and critical review of the manuscript, LMB contributed to data interpretation and critical review of the manuscript, JCN contributed to study design, data interpretation, and critical review of the manuscript. This study was supported by grants from Sao Paulo Research Foundation (FAPESP) and Brazilian National Council of Research (CNPQ). This study was financed in part by the “Coordenação de Aperfeiçoamento de Pessoal de Nível Superior”—Brazil (CAPES)-Finance Code 001. The funding sources had no role in study design, decision for publication or data analyses. R.H.M. Furtado: Honoraria: AstraZeneca; Research Grant: AstraZeneca, DalCor, Boehinger, Pfizer, Bayer, Sanofi. R.P. Giugliano: Research Grant: Amgen, Merck. Honoraria; Significant; Amgen, Daiichi Sankyo, Merck. Consultant/Advisory Board; Significant; Amarin, Amgen, Boehringer- Ingelheim, Bristol-Myers-Squibb, CVS Caremark, Daiichi Sankyo, GlaxoSmithKline, Lexicon, Merck, Portola, Pfizer. T.F. Dalcoquio: Travel grant: Bayer; Research Grant: AstraZeneca, DalCor P.R.R. Genestreti: Advisory board: NovoNordisk, Sanofi, AstraZeneca; Speaker board: NovoNordisk, Sanofi, AstraZeneca, Boeringher-Ingelhbeim, Eli-Lilly, L.M. Baracioli: Research Grant: AstraZeneca, DalCor J.C. Nicolau: Research Grant: Sao Paulo Research Foundation, Amgen Inc., Bayer Healthcare Pharmaceuticals, Bristol-Myers Squibb Company, DalCor, Janssen Pharmaceuticals Inc, Sanofi-Aventis, Astra Zeneca, Boehringer Ingelheim, Novartis, Pfizer Inc. Consultant/Advisory Board; Significant; Sanofi-Aventis. All other co-authors have nothing to disclose. Patients with stable CAD were enrolled from two randomized clinical trials (NCT02389582 and NCT 01896557) and one case-control study conducted at our institution. These three studies were approved by our institutional review board and all patients signed informed consent form (ICF) before obtaining blood test for assessment of platelet aggregation or serum TXB2 dosage. In the case of patients with ACS, platelet aggregation was obtained in a routine basis at the CCU discharge and, because of that, ICF was waived according to local regulations. All data from this report were analyzed by two independent authors (RHMF and RS) using de-identified patient information.